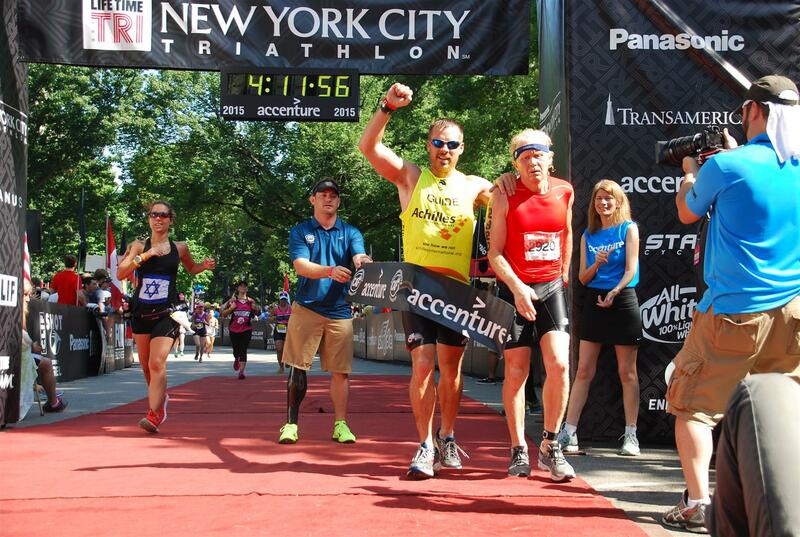 This past weekend I participated in the 2015 NYC triathlon, an Olympic distance race that takes place in and around Manhattan. 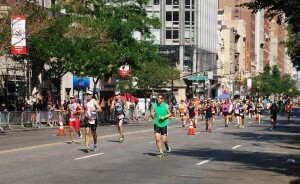 The race is your standard large city race with about 4000+ participants. 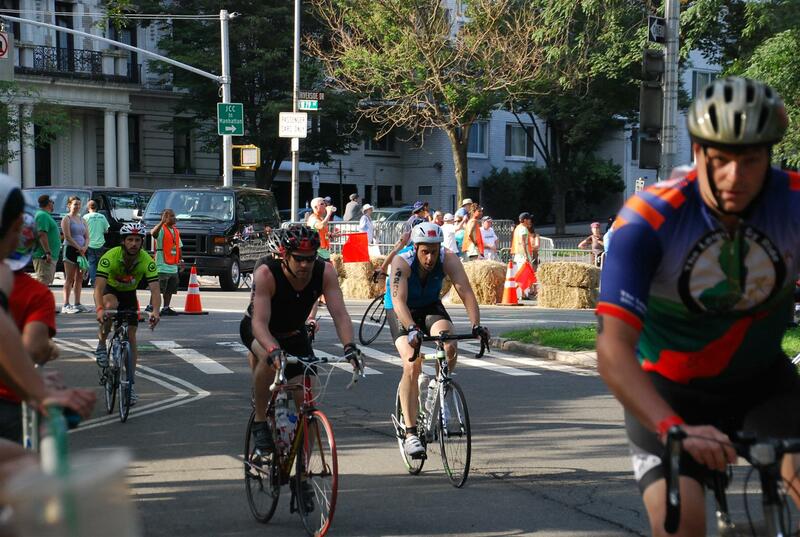 Race packet pickup and mandatory bike racking begins Saturday in Midtown and then transition area near 72nd Street. Be sure to leave plenty of time Saturday afternoon to tend to these formalities. At the packet pickup there’s also an expo, where you can purchase all kinds of endurance related gear, running gear, wetsuits, tons of athletic food options etc. The expo was smaller this year than last, but all the usual folks were there. 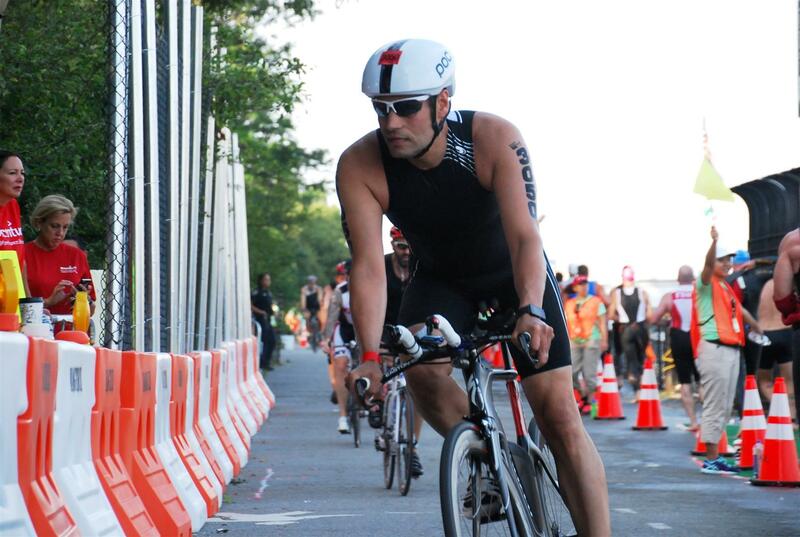 Once all that is complete, head on over the transition area to rack your bike. The race has two transition zones, color coded, yellow and red. The yellow zone is primarily the pro and elite fields, plus women and relay divisions. The red zone is mostly the male age groupers and the para athletes. Once you deposit your bike your done, then just set your alarm for 4:30am to get up the next morning. If your’re driving in , be sure to arrive early around 4:30am as there will be plenty of traffic near 72nd street due to the road closures. I recommend a parking deck near the race.. Then just head to your transition area and make your final gear preparations. The yellow transition zone goes off after the pro field around 6am, and then after them the red transition area. The race for the Pro’s uses an equalizer format, where the women get a 10-12 minute lead and them men have try and chase them down before the finish, the overall winner gets some extra prize purse. 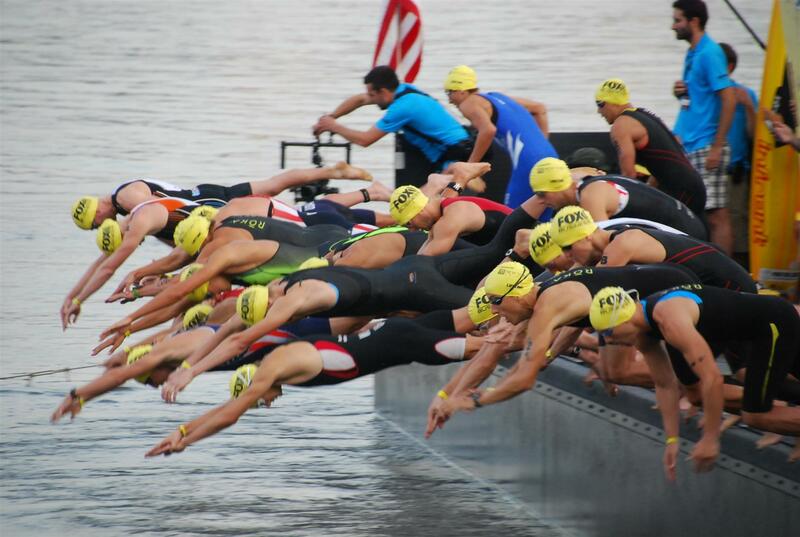 For the rest of the age groupers its your typical wave start with 22 or so waves per transition zone. In between red and yellow there’s a 20 minute wait for the last of the yellow wave folks to exit the water, before the first of the red wave swimmers go off (this is partially due to the sharing of swim exit and bike exits in the yellow transition). 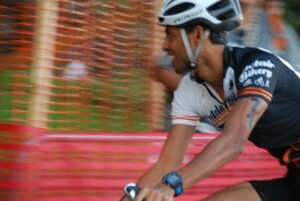 Luckily I was near the front of the red transition zone, so I was in one of its first waves .. I chatted with a few fellow racers whom I met before the short walk down the ramp and onto the dock, with the timing mats. 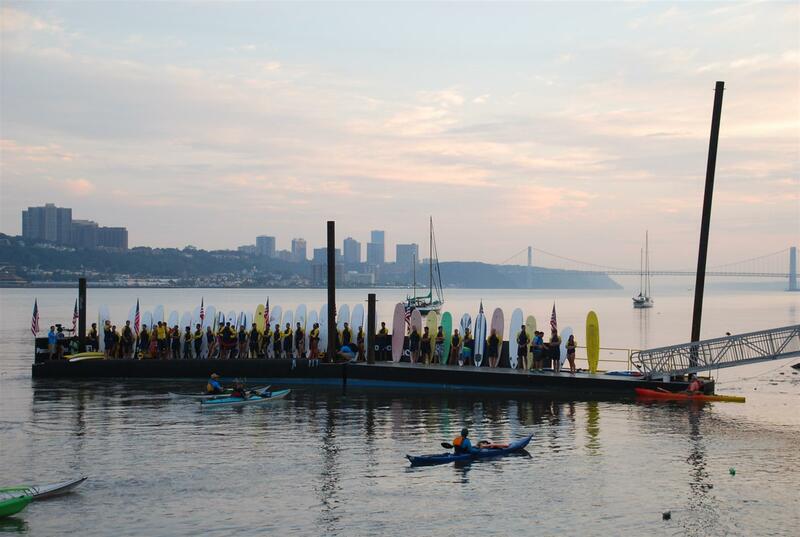 Once you’re at the dock, your chip is activated by standing on the mat, the race officials then direct athletes to jump in 15 at a time, every 5 or 10 seconds. 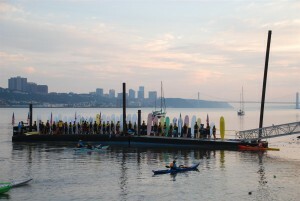 A short jump about 3-4 feet off the dock and you’re swimming in the Hudson. The swim in the Hudson River is pretty much along the river bank of Riverside park . 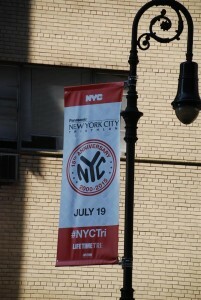 Its starts about W 100 street down to the 79th Street boat basin, where the exit ramp is located. 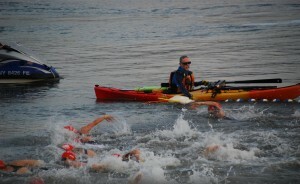 Its a straight current assisted swim, in fact much of the scheduling around this race deals with ideal current conditions. It’s almost always wet-suit legal (for age groupers, even today the one of the hotest days of the year) . 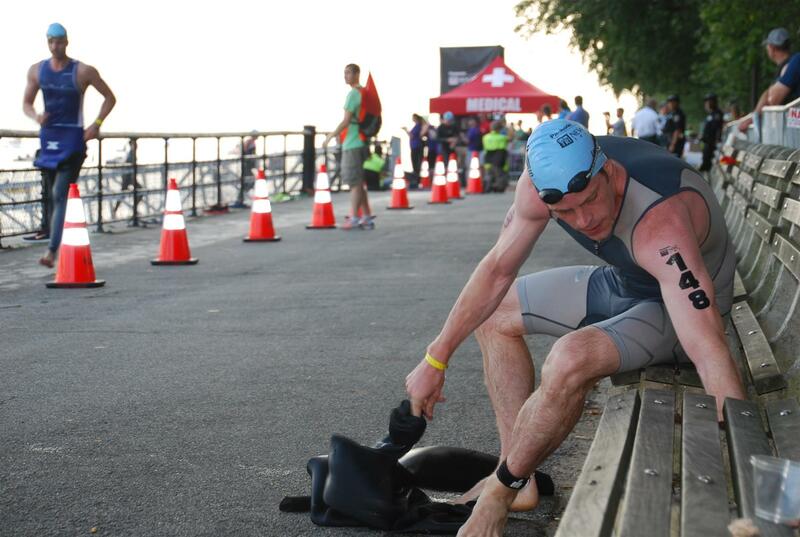 Because its with the current the 1500m swim is fairly quick with the pro’s exiting in about 12 minutes and most age-groupers around 20min. Supposedly swimming further out (towards the middle of the river ) is supposed to help you catch a faster current. 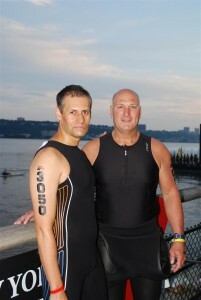 I elected to swim without a wetsuit, because of the expected current assisted swim. 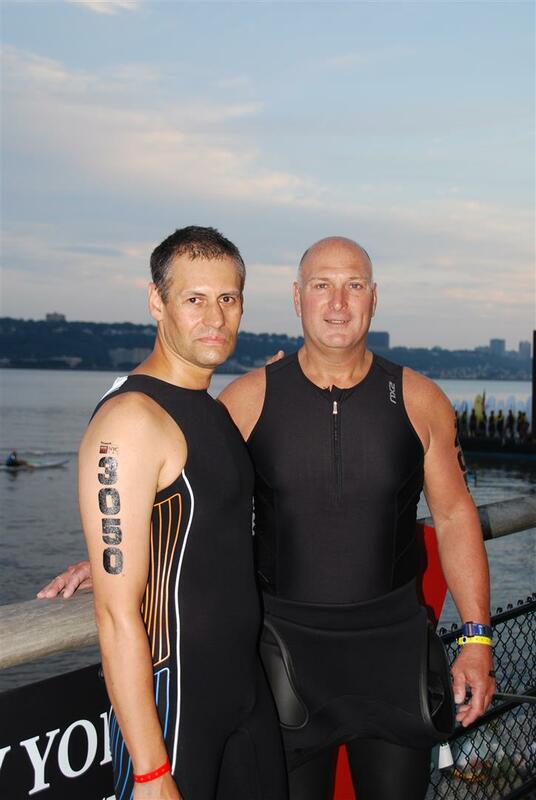 The swim started off fine, but it didn’t seem as fast as I expected, knowing this next time i would have worn the wetsuit. It’s a fairly easy swim since its just straight and along side the river back rock wall there are occasionally meter markings to let you know how far to go. Because of the time-trial start there’s not too much contact. I managed to catch a few feet, but didn’t have the best lines going down river. I kept wondering , why the swim was taking so long, thinking I should be done in 15 minutes but in reality it a took a bit longer, so much for unbridled expectations. Even though it’s a straight swim, its hard to gauge exactly where the exit ramp is from the water until you get closer, then there are plenty of volunteers there to help you out of the water.. The swim has plenty of lifeguards and other water safety folks , so its definitely a very safe swim. Water quality was ok, the occasional twig and debris floated by but nothing too horrible, just be sure to rinse after the race. After a brief run up into T1 , snap on the helmet and go. Coming out of T1 (red transition) there’s a short 300m flat section before the sharp right hand turn and climb up to the Henry Hudson parkway road. Its about 8-12%n grade for a short bit like 100m, before it flattens out. Once on the Henry Hudson Parkway and Westside highway, the race road is closed to traffic, so all you need to worry about it dodging other riders and the occasional fallen water bottle. Road surfaces especially the first few miles are poor, so keep an eye out. Also there’s a lot of passing and being passed so stay attentive. The road is straight virtually no turns (minus the turn around points), but it has highway grades that range from 3-4% to 10% for quarter to half mile stretches. Also after about mile 10 when you near the Moshulu Parkway you will be treated to newly paved road surfaces. he road after about mile 4 is rolling with some mild gradients. The first major climbing section comes at about mile 7, from there you pass through the toll booth, it flattens out a bit before another mild climb about mile nine. At about mile 9.3 you begin a long (about a mile) , fast descent heading towards the Moshulu Parkway road. This section of road will allow the brave descender’s among us (not me) to reach 40+mph, and because of the smooth road surface (it was recently repaved) it can be covered in under 2 minutes. The road then flattens out a bit before the last section of climbing up to the Gun Hill Road turn around, you’ll know its the last climbing section towards the turn around when you pass the Degan Expressway/Triboro 87 underpass round mile 11.4 . Then its all back. the way you came. The ride back seemed easier after you go past the longer climb near mile 13. I tried to maintain a steady pace, but lacked confidence to open it up on the descents and lost some valuable time there. I also wasn’t spending enough time in my aero bars, I still need to get more comfortable with my bike. The fuelsalge water bladder worked well this ride and kept me pretty well hydrated throughout. 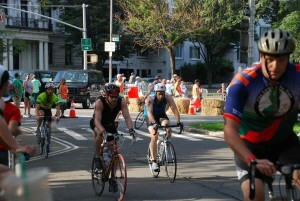 The bike course ends when you go past the transition and for about a mile head down the West Side highway, we’re you’ll see the distinctive Manhattan skyline to your left and the cruise ship port’s to your right. The its one more turn -around at about 57th street, and a tiny bit more climbing as you head back into transition which is now only one mile away. Overall I wasn’t happy with my performance, I did feel decent on the climbs it was my descending and comfort in the aero position that bothered me. 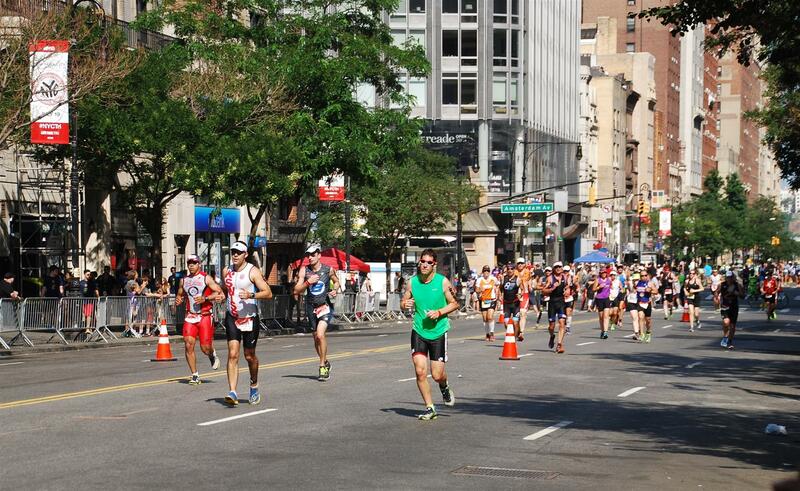 Once in transition it was a quick change, sipped some more water, and as the heat became obvious I started the run. we go out towards the dog park , going up the short steep ramp that leads onto the dog park and then onto 72nd street. Be sure to enjoy this part , here you’ll find some of the bigger crowds cheering you on, its pretty motivating. The heat of the day became real obvious at this point, I decided to take another gel, early like I did in Philly in the hopes it would supply the remaining power for my run. 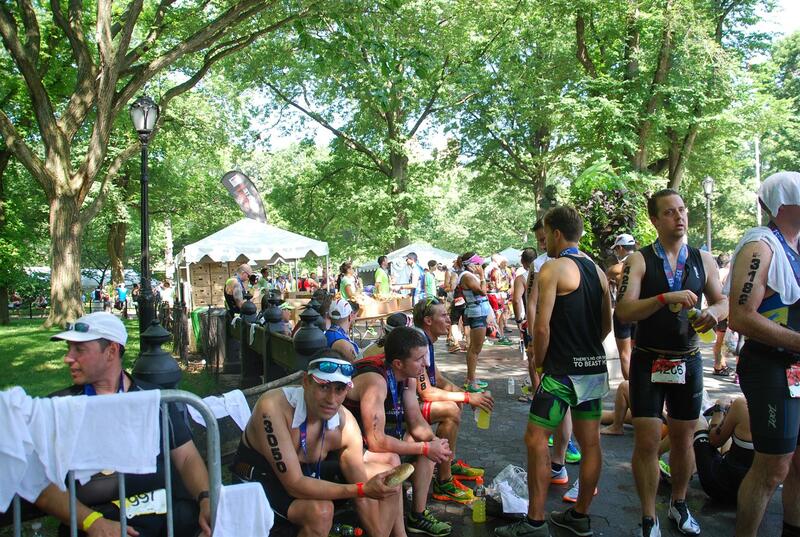 After about a mile you enter Central park and head up counter-clockwise to complete the 10k. 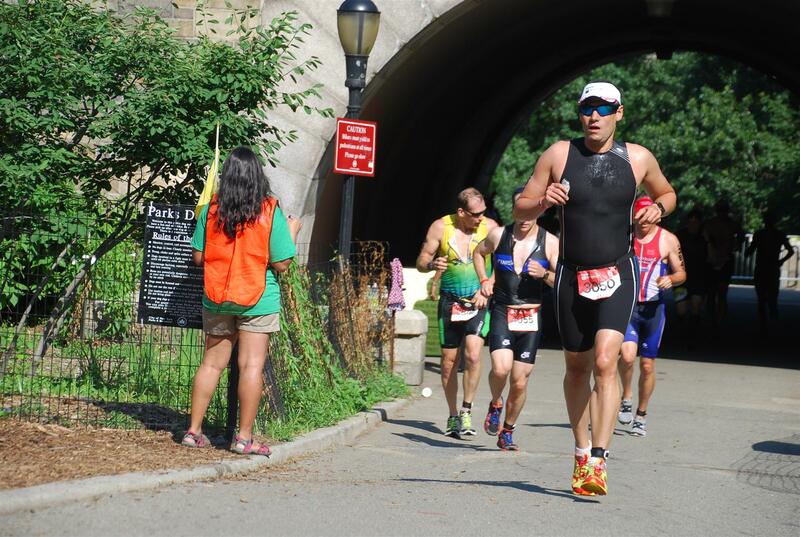 There are hills in the park, if you have never run in central park its advisable you do so . Most the hills are from miles 2-4 , then it levels out a bit. After about the 5k mark , the heat was just too much, and myself along with other folks started becoming the walking wounded, first I walked only through the water stations, but then even trying to maintain a jogging pace became difficult. I managed to find another fellow competitor Paul, whom we managed to encourage each other and pace off one another for a while… This proceeded until the last mile, where the impending finish and crowd helped bolster my strength and I managed a a stronger jog to the finish. 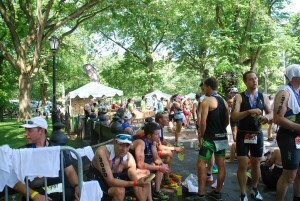 There’s a nice long finishing shoot, and you’ll hear the announcer and post race festivities. It was over , the heat sapped whatever strength I had , all the finishers had the same look on their face, exhaustion and pretty overwhelmed from the hot day (I think it was the hottest day of 2015..thus far). After getting some more refreshments and some food, it was another mile walk back to transition to collect my gear. 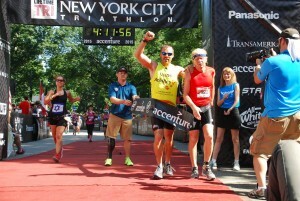 Overall I liked the NYC triathlon, its a very well organized race , its definitely a race to do once if you have never done it, but it is an expensive race, money and time-wise (you basically need to dedicate your weekend to the race) and assuming you’re not staying over night in NYC expect the race to cost you close to $500 ($290 /registration + $50-$100 parking and toll fees for both days), if your staying in-town tack on another $500 for lodging and food. 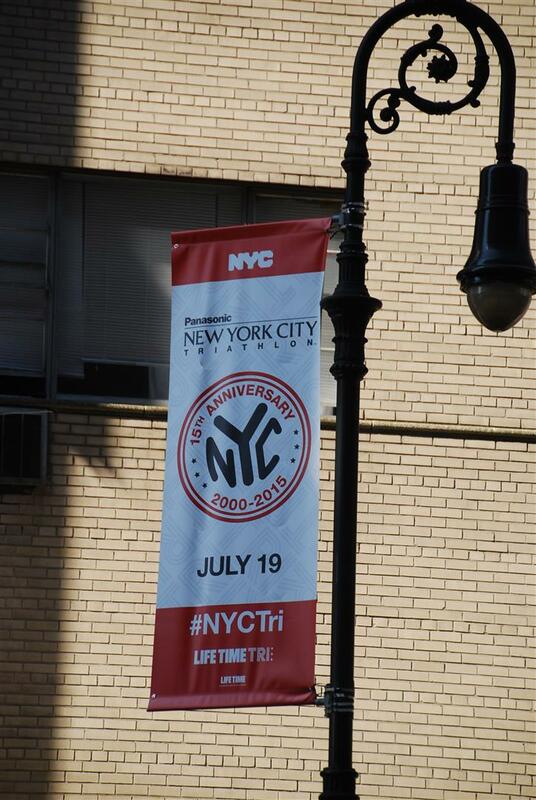 But hey its NYC and you get the thrill of swimming , running and biking around parts one of the worlds greatest cities in areas that are usually not available for those things. You’ll definitely be treated to a taste of NYC (and I’m not just talking about the Hudson River water 🙂 ) so soak it up! Race entry for age-groupers is by Lottery (usually around Nov.1 ) or by association with a charity.